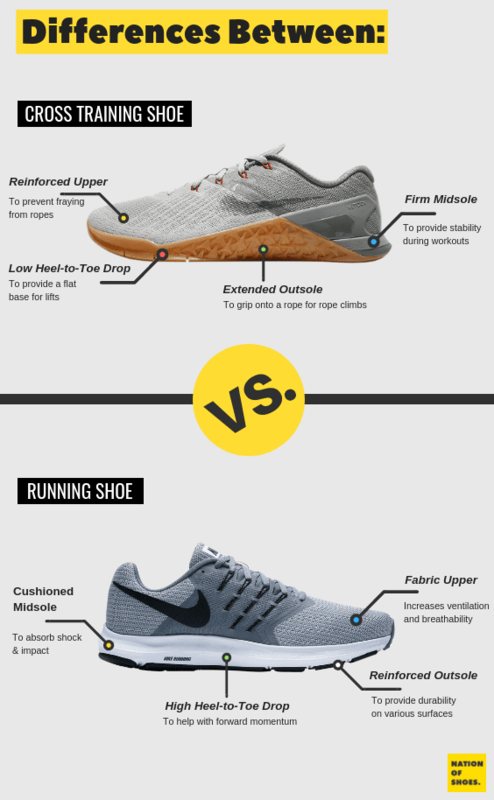 Home Foot Health Training Shoes vs Running Shoes: Which One Should You Buy? Performance shoes serve a variety of purposes and cater to a wide spectrum of athletic audiences. There are many types of shoes available on the market today, and it can be difficult in picking the right athletic shoe for you. There are some factors to consider before you whip out your wallet. In this guide, we will explain the differences between training shoes vs running shoes and also detail the various types of shoes that exist in the market and how their features are optimized for a variety of physical activities. The right shoe can make or break your physical routine and it is, therefore, a fundamental purchasing decision. All major sportswear brands have invested heavily in their athletic shoes and you will find footwear with all kinds of quirky cosmetics and function. Shoe technology has advanced to a point where we are able to perform longer and harder than ever before. We now have footwear that is created from recycled ocean waste like the Adidas Parley series that not only serves a good cause but also look great on your feet. 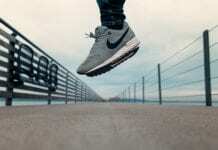 Moreover, advances in Sports Science have allowed for the creation of long-lasting shoes that adequately handle the strain of multiple physical activities. By following this guide, you will be able to pick out between training shoes vs running shoes, or any other shoe for that matter. You will also get some knowledge into shoe maintenance that will help last your footwear a long time and provide you with the same level of comfort and performance as the day you first bought it. One of the most common types of athletic shoe is the running shoe. Running shoes have become far more prominent lately with the advent of lifestyle/running shoes like the Yeezy’s introduced by Kanye West. However, the function, as well as the form of these shoes, have also improved. They are specifically designed for enduring the ridiculous amounts of force acting on your foot while running. Couple that with the fact that they have become a mainstream item and fashion accessory that can be worn for everyday use. This is due to the best-in-class comfort they offer, and a high-quality build which ensures they last a long time. Compared to other shoes, running shoes come packed with extra cushioning to make for smoother landings. They absorb much of the impact between the ground and the ball of your feet. Running shoes are designed to endure repeated abuse regardless of if you’re a casual stroller or a marathon runner, and they’re built to maximize your running performance. They are also crafted to be very breathable and their lightweight design means you can use them for long periods of time without being affected by foot fatigue. Running shoes may sometimes have night-time reflective strips that increase your visibility during late night jogs. Let’s be honest – no one fancies becoming a road pancake. Running shoes are made to be used on a multitude of terrains which makes them suitable for both roads/pavements and cross country. This roughly translates to you needing only one pair of shoes to suit all your running needs. Running shoes are purpose-built to absorb high levels of shock while also providing superior levels of comfort. This is particularly crucial for runners as the risk of knee/joint injuries are quite high. Another type of athletic shoe is the cross trainer. This is a shoe that is designed for specific physical activities and is ideal for those who engage in a wide variety of exercises. They are designed to provide stability and support for strenuous workouts. Cross trainers provide flexibility and act as a combination of different types of athletic shoes. They have multi-purpose outsoles which are thick, offer a significant amount of traction, and are ideal for sports or at the gym. Their overall stability is excellent, which helps in switching between different physical activities. They provide a moderate level of cushioning and superior support for lateral movements. Cross training shoes combine the features of sports specific shoes and walking shoes to provide a stable platform for all your workout needs. They are not ideal for regular runners but can get the job done for those who like to run sporadically. It can be quite cost-effective to purchase cross trainers even if they may be a tad more expensive than specialized shoes. The main benefit from a cross training shoe comes from its versatility. A trusty pair of cross trainer shoes can declutter your shoe rack and leave you with one piece of footwear to perform a multitude of activities. Not everyone will need shoes for high-endurance activities. You may require a reliable shoe for everyday use and some casual walking. Walking shoes are similar to running shoes in a few aspects, but they do have some noticeable differences. Walking shoes have good amounts of cushioning, although this may be slightly less than running shoes. These shoes are fairly flexible and can be used for a range of low-impact activities. They are lightweight and agile, which makes walking a breeze. Walking is one of the easiest and best forms of exercise, and these shoes make for the perfect companion. Walking shoes also possess a “style” factor and there’s nothing quite like showing off your new kicks. Their everyday use means that you can get value for money, all while looking cool. Walking shoes have superior breathability will means you can go on long walks without worrying about sweaty feet. They are, however, primarily built for even surfaces, which means they won’t be suitable for hiking. The soles are thinner than running shoes since the landing force of a walk has far less impact than that of a run. You won’t be disappointed if you’re looking for shoes that are specifically designed to be worn for a certain type of sport. These shoes are built with the sport in mind and therefore their primary purpose is to help you reach peak performance in that particular sport. This makes them a fantastic addition for professionals and amateurs who regularly play just one sport. Basketball shoes, for example, feature high tops which provide additional ankle support while golf shoes are designed to be sturdy and have cleats to prevent from slipping on the grass. Tennis shoes have a focus on lateral support due to the various quick movements needed on a tennis court. They have less cushioning than running shoes because the surface of a tennis court is flat. Sports shoes are usually constructed from a breathable material that helps to prevent sweat and moisture and it is evident that these shoes all have specializations that make them ideal for the sport they were built for. If you play one specific sport regularly, then buying a shoe made for it is a no-brainer. The main disadvantage of sports shoes is their distinct lack of versatility (try wearing your tennis shoes to the gym). There are certain things to look for when picking your next pair of performance shoes. Some prominent features are present in most athletic shoes. One of the main reasons that athletic shoes are superior to regular shoes is because of the premium cushioning they include. It is also important to consider a shoe that is breathable since this will prevent sweating and provide a far more comfortable experience. The sole is one of the most important parts of any shoe. It actually consists of three separate layers. The outside part of the sole is built to withstand the stresses of an intense physical activity. The material used is usually carbon rubber since this material is extremely durable to heavy strain. The midsole is responsible for cushioning and is manufactured from a variety of different materials like foam or gel. The thickness of the midsole determines the amount of cushioning provided. Cushioning is a particularly important factor when engaging in activities that require heavy landings and helps to reduce foot strain. The insole is important for providing arch support. Arch support is essential during physical activities as it reduces the risk of injuries or if you suffer from a foot condition like flat-feet. One advantage of running and walking shoes is that they provide a removable insole that can be washed. The body of the shoe is also critically important. The toe box is one of the most important features to look out for when gauging fit. There should be adequate room left in the toe box to allow for a comfortable fit. It is recommended to leave about half an inch of wiggle room between the tip of your big toe and the inner fabric of the shoe. The body of the shoe also features a heel counter which stops your heel from slipping. This is important in sports where the heel is in frequent use, such as basketball. The material used for the upper is primarily synthetic (sometimes fabric) which allows for superior breathability. Athletic shoes will sometimes use a different form of lacing when compared to regular shoes. There are different types of lacing materials that can help to make the process fast and to make the loops tighter. This is important in athletic activities since untied laces can become inconvenient and even a safety hazard. The style is also an important consideration to have when selecting shoes. Running shoes have become an everyday fashion symbol, which means they also function as everyday shoes. Style can be just as important as function and this is why modern sneakers are crafted to provide efficiency whilst also giving a sleek aesthetic. Before buying a running shoe, there are some key details that can aid in your purchasing decision. One of the most important things you should do before purchasing running shoes is to analyze your gait. This can be done in some stores and can be done yourself. Your gait will be an important indicator as to the specific type of running shoe you should purchase. You may notice that your feet excessively roll (inward or outward). There are motion control shoes available that can help to counteract this. The landing of your feet is also important and if you tend to over-supinate, then buying a running shoe with extra cushioning may be ideal to absorb the shock. If you already have running shoes that you frequently use, you can take them to the store and a sales assistant will be able to gauge the wear pattern to help you with your purchase. The fit is always king when it comes to shoes, however, it is even more important when purchasing athletic shoes. A bad fit can ruin your exercise routine and it even has the potential to cause injury. An ill-fitting shoe can even cancel out the advantages such as cushioning and motion control. It is therefore critical to find the ideal fit before making a purchase. It is better to shop later during the day since your feet tend to swell and this will give you a better fit. Sports shoes do not usually need to be ‘broken into’ and they should feel comfortable as soon as you put them on. If there is any discomfort, this should be a warning sign that they are not suitable for you. Running shoes and cross trainers are both viable athletic shoes and they both serve a range of purposes. There are also specialist shoes that can help you get the edge in your sport. You will now have a far more precise idea of the different types of athletic shoes and how their differences make them suitable for various activities. Hopefully, this guide has motivated you to make the purchase that will allow you to achieve your intended fitness goals.